With my latest project completed, and with the winter fast approaching, decision time will soon be upon me. As I’ve repeated many, many times before; I do not like woodworking during the winter months. 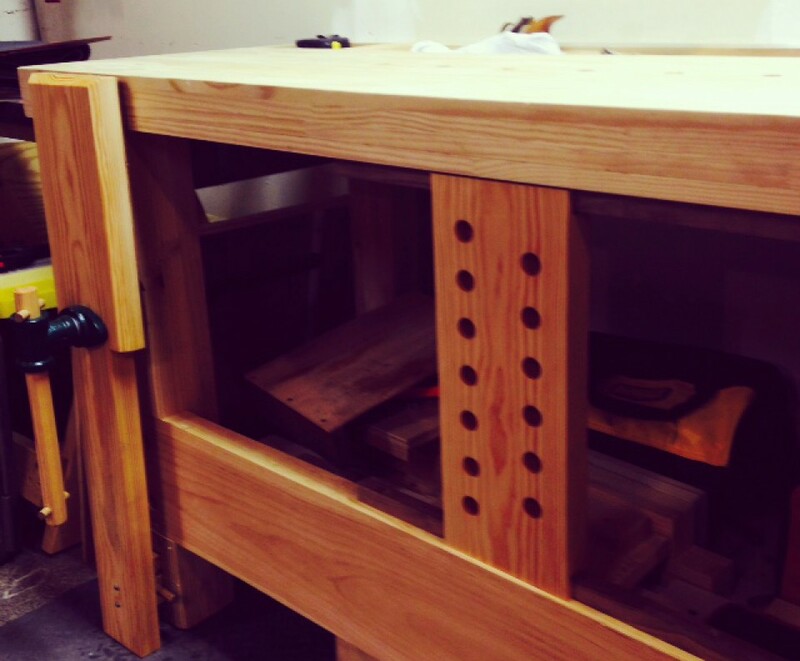 The past three or four winters have been particularly cold and long, and everything about woodworking becomes more difficult during those months. However, I do have a few ideas cooking. I had mentioned in another post that I would like to attempt to make a project using construction lumber. I think I may have found two that would be suitable. One is a table I happened to see in a magazine called Early American Life. I’ve seen tables such as this one before, but I’m not really sure what I should call the particular style. I sketched it from memory and allowed my daughter to color it in (just for fun). To me it looks similar to a Shaker style table. Whatever it may be called, it is certainly falls well within my skills and tool set to build. And because my wife has asked me to make a project that she could paint, I think this would fit the bill nicely. I’m still not completely settled on the design, though. The table has a drawer, most end tables do, but I’m not sold on the idea of it “needing one”. A table of this size has only the space for a small drawer, which to me borders on useless. It will fill up with half-dead AA batteries and junky pencils with cartoon characters on them. Though a drawer would be a good excuse to practice half-blind dovetails, I can easily get in some practice on those without having to build a table around it. Rather, I think the table will have a false drawer, because I believe it will look a bit bland without one. The other project is something my wife specifically asked me to build. Firstly, it’s not a piece of furniture; it is basically a shelf that she found on Pinterest. To put it mildly, I’m not very “pinterested” in building it. Bad puns notwithstanding, because my wife rarely asks me to build specific pieces of furniture, and because it seems fairly simple to build, I think I will build it for her sometime in December. Otherwise, I have one other goal for the upcoming winter, and that is sharpening. For the past few weeks I’ve been sharpening my tools whenever I get a spare moment. I’ll be experimenting with different methods, not that there’s anything new under the sun when it comes to sharpening woodworking tools, but there may be some methods or sequences that work better for me than others. So far, I’ve changed little, and I’m still sticking to the typical diamond plate, water stone, strop method. The first real changes I’ve made thus far is the amount of strokes I take. My chisels seem to benefit from a relatively short sharpening time, with the most time spent on the 8000 grit water stone. The plane irons seem to benefit from more time on the diamond plates. With the strop, I’ve taken to a heavier hand, using more force than I normally would. It has seemed to make a slight difference, but nothing overwhelming. For this experiment I am trying to use a scientific method, documenting my methods in a note pad and notating the results. Whether or not it makes a difference is another matter, but it should keep me busy for a little while. November 3, 2015 7:57 pm / 8 Comments on Book it. At a glance, I can understand the downward trend. Woodworkers have been building bookcases since printed books have become readily available, and woodworking writers have been writing about them for almost as long. Bookcases can be boring; bookcases can be simple; there are hundreds of how to books at home centers and on the internet that cover thousands of different bookcases. I can understand why most mainstream writers really just don’t feel like writing about the topic anymore. But the problem with following the downward trend is that bookcases are perhaps the most practical project the home woodworker can construct. All casework starts off as a box, from your basic set of Ikea shelves to a Philadelphia Highboy. While bookcases can certainly be dull, they are also easily modified. Unlike certain forms of furniture, bookcases can be changed in an innumerable array of configurations. What makes this fact so important is that bookcases are a great project for both beginners and seasoned woodworkers. A beginner woodworker can make a decent bookcase with a circular saw, a drill, a few chisels, a block plane, and some sandpaper. The seasoned woodworker can take that basic case, add crown moulding, columns, or any one of hundreds of design elements which can turn a basic case into a piece of fine furniture. Even more to the point, bookcases are far easier to design using the features of several different furniture styles. Elements of Shaker, Arts & Crafts, Modern, and the Colonial styles can be incorporated into bookcase design by a skilled woodworker. While a table, chair, or chest of drawers may look disjointed and messy if the designer tried to add several different design elements, on a bookcase it seems to work far more readily. Most important of all, bookcases provide something we all need: storage. Furniture in its basest form is built to hold our stuff. Chests of drawers hold our clothes, chairs hold our bodies, and bookcases hold our books, among other things. Nearly everybody has books, photos, knick-knacks, etc. that need a place to stay. I personally don’t know a single person that couldn’t use another bookcase or two. And on that note, it is my belief that the first piece of furniture a woodworker builds should be a bookcase. I challenge anybody to name a general piece of furniture as practical as a bookcase. And despite what some woodworking writers say, it takes real talent to take a set of shelves and make it look like “fine furniture”. If we as woodworkers can learn to do that, we can learn to build anything.